On Sunday our pastor spoke on Amos and I felt so challenged about the way I live, ashamed that my frugality seems to have sprung from not earning much rather than compassion for the world around me. From the first musings of planning my self employment I wanted to my work to be ethical, to use re/upcycled components and that is still a determination to introduce more of that aspect into my work. Currently I use recycled packaging from Eco Craft, use found sea glass and pottery, recycled silver in the form of Art Silver Clay and I recycle a small amount of beads and buttons. I really want to go further. I need to go further. 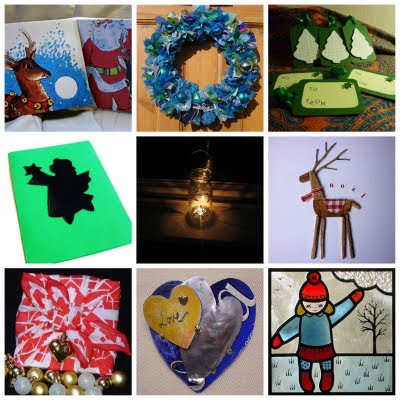 Folksy is packed full of ideas and clever upcycling with the Upcycle Christmas Competition in aid of Sue Ryder and even this morning I spotted a forum post encouraging the exchange of unwanted household items which others use in their work. The selection below is a tiny speck of the re/upcylced gorgeousness you can find there. So, whilst today's selection isn't all green in colour, it certainly is in ethos, as all the items have been upcycled into gorgeous new pieces allowing you to continue and enjoy the tradition of gift giving in a more environmentally friendly way. I know not everyone has the time to make their own decorations and gifts but I urge you to think about the environmental and social impact of what you buy this Christmas. Make it a happier Christmas for everyone!